Picking up where the 2015 edition left off, 2016 Topps WWE Road to WrestleMania covers the journey leading up to WrestleMania 32. Each hobby box yields two hits. The 110-card base set is broken into two different subsets. 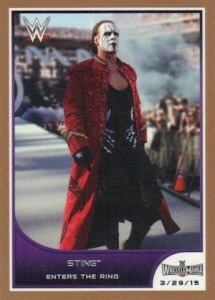 The first 85 cards include the greatest WWE moments and matches of the year. The final 25 cards cover the same basic thing, but with a focus on NXT events. Parallels include WWE Tag Team Bronze (1:2 packs), Divas Silver (1:24 packs - Hobby only), Intercontinental Gold (#/10) and WWE World Heavyweight Red (1/1). Offering a variety of hits, 2016 Topps WWE Road to WrestleMania includes relics, autographs and autographs relics. On-Card Autographs are numbered to 99 and also include parallels. Dual Autographs double the signers and feature a print run of just 11 copies. Triple Threat Autographed Dual Relics Cards (#/11) combine shirt relics and mat pieces along with a sticker autograph. A first in WWE products for NXT Divas, Road to WrestleMania collectors can find NXT Diva Kiss Cards and Autographs that feature a lipstick kiss. More traditional relics come in the form of Shirt Relics and Battleground 2015 Mat Relics. 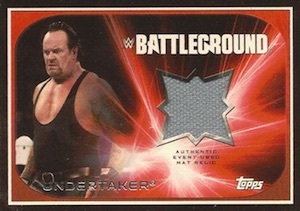 Battleground 2015 Turnbuckle Pad Relics (#/25) include pieces of the turnbuckle pads. 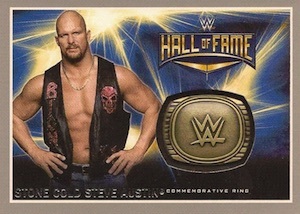 Rounding out the hits in 2016 Topps WWE Road to WrestleMania, WWE Hall of Fame Commemorative Rings are numbered to 299 and include a manufactured HOF ring embedded in the card. Additional insert options push the total set to 180 cards. WrestleMania 32 Roster Cards (1 per pack) include 30 top Superstars and Divas from WrestleMania 31. Featuring ten characters from the mobile game, WWE Immortals average 1:6 packs. 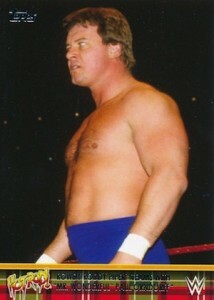 Paying respect to some of the all-time greats who passed away, Rowdy Roddy Piper Tribute and "The American Dream" Dusty Rhodes Tribute both average 1:6 packs and feature ten-card sets. Dwayne Johnson is also celebrated with The Rock Tribute that includes ten cards from a 40-card continuation set and averages 1:6 packs. The remaining 30 cards will be found in other 2016 WWE sets. 113 cards. Shop for base sets on eBay. 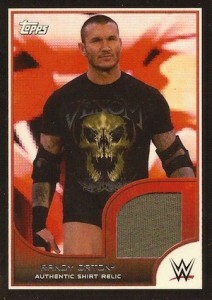 Cards #111-113 are promo cards exclusive to several DVD releases. 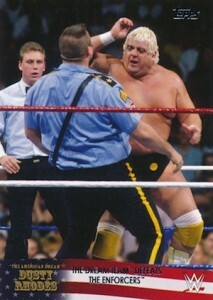 78 Team PCB - Defeat Team Bella and Team B.A.D. Terry Funk & Dory Funk, Jr.
10 cards. Inserted 1:6 packs. AWESOME SET! Nice inserts and also the Base Set has a cool 20 card short-print card set to collect! Decent card set. I was highly disappointed with the insert sets. I bought two boxes and got the exact same inserts in both boxes. The same 24 Wrestlemania 32 Roster cards, same 4 Piper Cards, same 4 Rhodes cards, and same 4 Rock cards. Maybe it’s some of that mess they pull where certain cards are only available through Retail or Jumbo packs. If that’s noted somewhere I missed it. I was able to get the complete 110 card base set so guess I will get the rest off ebay so I don’t add to the thousands of duplicate cards I already have from all my years of buying cards. Very fun set to collect. Dan, would you be interested in selling the John Cena Printing Plate?